Sources tell the Express that NBC national paid for the hotel room of Derick Almena, the operator of the Ghost Ship warehouse that burned Friday night, killing 36 people and displacing others from their homes. A spokesman for NBC confirmed today that the company paid for the room at the Marriott in downtown Oakland. Rooms begin at $150 a night. 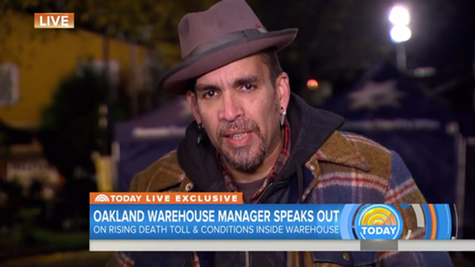 Almena did an interview with NBC's Today show yesterday. He told Matt Lauer that he was sorry for the fire. On Monday, he did another short interview with NBC Bay Area, telling reporter Jodi Hernandez that he and his partner Micah Allison are in a state of shock and grief. People who work in the TV news industry said it's standard practice to pay for the hotel rooms of people being interviewed. In addition to killing 36, the fire also destroyed the homes of artists who lived in the building, leaving them homeless. In the immediate aftermath of the deadly blaze, Almena's whereabouts were unknown. According to several news reports, he and Allison checked into the Marriott on Sunday night. Many artists and others who live in affordable warehouse spaces worry now that the city will crack down on code violations and displace them from their homes.